The Bible clearly teaches that God made a distinction between His people and the world (Lev 13:46; Number 5:3; Deut. 7:3). Christ says that entering the Kingdom of God means being bound to the Church “on earth” (Matthew 16:16-19; 18:17-19). It should be a time of fellowship, learning, sharing, giving, receiving, and spiritual encouragement. A time to build one another up by what the other members of the body supply. The reasons for meeting together as believers are more than just to listen to someone else “preach” to us. We need to become involved in the body of Christ. When the Bible was written in the early days, the only way to hear the anointed teaching of the Word was to physically gather together when a Bible teacher was present. Today we are not limited to a time or place, because of recorded media. However, this too can be a double edge sword. Many people in our culture and society (yes, even professing Christians) simply believe that meeting together as members of a local church is not necessary. Some feel that faith should not be “institutionalized” and should be a private matter between individuals, not something to be experienced in a physical community or a social media one. While the Bible does warn us, in the above verse, not to forsake meeting together with other believers (Hebrews 10:25), it never tells us how often we should meet or where we should meet. Also, when we meet together God did not intend for it to be just a ritual, but something beneficial. Mia had a heart for outreach. She often visited with women who were homebound, chronically ill, or were caregivers of disabled loved ones. Over and over again, she heard the women express the same desire. They longed to be part of a women’s group but their circumstances made travel (even short distances) difficult on the best of days. After some prayer, Mia partnered with a woman in her church who enjoyed doing Bible studies. Together, they started a Tuesday evening meeting through Facebook Live. This allowed Mia to minister to those who were sick and disabled. Are there people in your life who are expressing a need that could be filled by the local church? 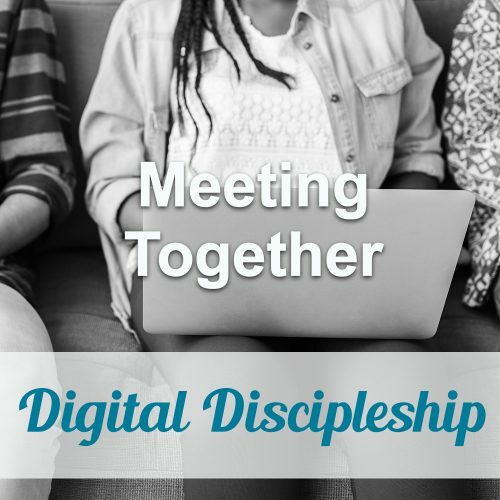 How can you and your Christian family use social media to meet this need? God, show me the needs of my community. Give my church wisdom and courage that we may rise up and comfort those that are afflicted. In Jesus’ name, Amen. Don’t let your church-going or social media events become just a ritual, get involved! A true “church meeting” does not require a large number of people. In fact, a smaller group is often best, as it is easier to share what you have and offer spiritual encouragement to others, as well as receive it yourself whether it’s in a church building or through social media.